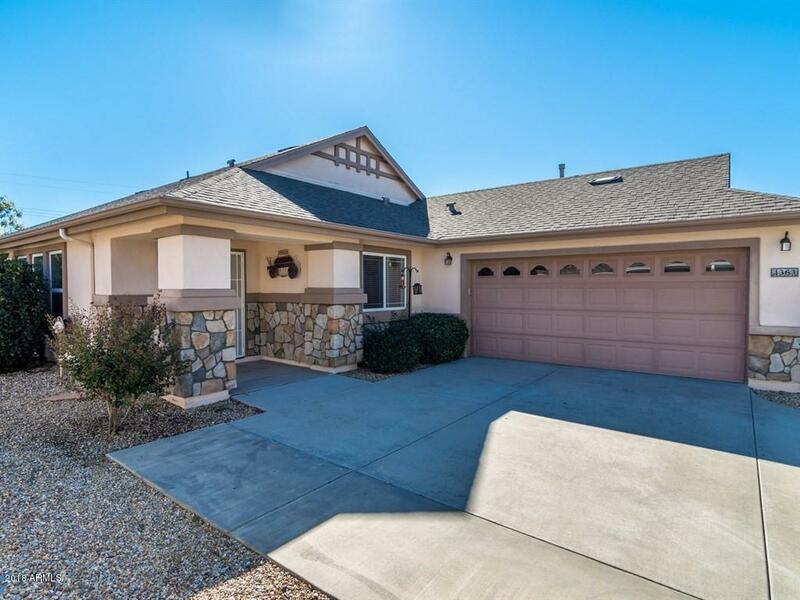 Charming patio home in The Cottages of Prescott Lakes. Great location off of the 10th fairway facing east. Very popular ''Bainbridge'' floor plan with great room, LR, 3 Bedrooms and 2 full baths. Cathedral ceilings, gas fireplace, built in entertainment center, Granite kitchen with gas appliances and room for table & chairs. Extra large master suite with large walk in closet, dual vanity and separate shower & tub. Many improvements including construction of enclosed rear patio, high quality wood looking laminate flooring, new interior paint, interior garage paint and new epoxy flooring. Prescott Lakes membership included in HOA fee. Enjoy fitness center, restaurant, hiking trails and nearby parks. Monthly HOA: $30 Cottages; Master $40; Athletic Fee of $135.17.